Harold Underwood and Thurman Bogle displaying their produce at the Cannon County Farmers Market. 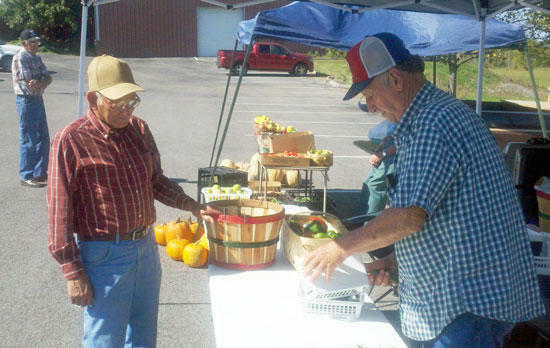 Thanks to “Mother Nature” warm days and avoiding the frost, the Cannon County Farmer’s Market is still up and running. Every Saturday beginning at 6:00 a.m., Harold Duggin, Harold Underwood, Thurman Bogle and Roy Parsley have a great selection of fresh fruits and vegetable. The market has been blessed to have a great line-up of producers this year, such as Melvin Ferrell, Ray Ship, Mr. Bivens to mention a few. Fall is rapidly approaching; the market is still a source of fresh fruits and vegetables. Along with Jack-O-Lanterns, you can find pie pumpkins, Green-Striped Cushaw Squash, butternut, tomatoes, peppers (sweet banana and Jalapeno, Anaheim and Cheyenne, habanero, poblano & green), potatoes, Tennessee apples and tomatoes and assortment gourds. One vegetable that symbolizes fall and is currently available at the market is turnip greens. The top portion or leafy part of the turnip harvested and served as a leafy green. When the turnip root is young and tender, the greens are harvested. The leafy portion of the turnip can be sautéed or steamed and added to main ingredients such as meat and vegetables or even served as a tasty side dish. For the health conscious consumer, turnip greens, raw (USDA #11568) – serving size 1 cup, chopped, calories 32, protein 1g, total fat 0g, total carbohydrates 7g, dietary fiber 3g, sugars 0g, potassium 296 mg, sodium 40mg and cholesterol 0mg. Most recipes in referring to preparing turnip greens, calls for ingredients such as salt, bacon, butter, and the optional hot pepper sauce or the standard vinegar. This coming Saturday, drop by the Cannon County Farmers Market at the Cannon County Arts Center for hand-picked, farm fresh turnip greens. The market opens at 6:00 a.m. and remains open till Noon or until the producers sell their produce. Information can also be found at the Market’s website at http://www.cannoncountyfarmersmarket or contact Bruce Steelman at the Cannon County Extension Office at 563-2554. Maggie, the farmers market is located in the parking lot of the Art Center every saturday morning. Can someone tell me why the Farmers Market is located at the Art Center, it is so far out of the way from the courthouse where they were at one time. I have heard a lot of stories why they aren't allowed to be on the square anymore. It was so convenient before now it isn't. I would like someone to explain it to me. Thank you. There are a lot of things one "hears" around Cannon County and a lot of it is BS. They were never told and it was never suggested that they weren't welcome on the Square. They moved to the Arts Center because they want a permanent structure or location where their enterprise will not be interfered with. That is not possible on the Square where there are many other activities and events which take place during the summer and fall.